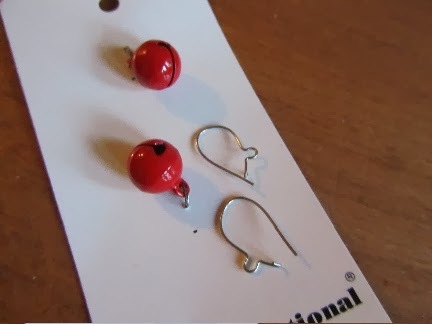 Jingle bell earrings -- super-duper easy! I was able to put the finishing touches on a few gifts this past week. If you're struggling to find an inexpensive gift or two for tween to teen girls, either gift may work for you. 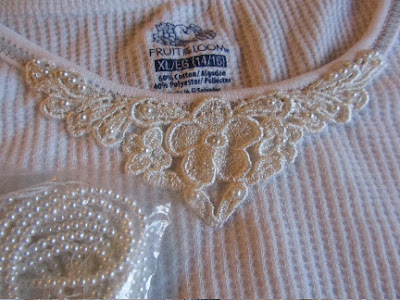 Next up, for my other daughter, more the "pearls and lace" sort, I had picked up some basic long underwear that I had intended to embellish in some way. 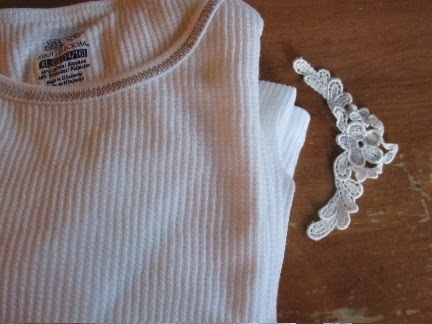 I hand-sewed the lace to the neckline of the long undies. Then, I added a few pearl beads to the lace (leftovers from another sewing project). It was quick and easy hand-sewing, taking about 1 hour total. I think the top turned out nicely -- just a way to make something plain a little more special. 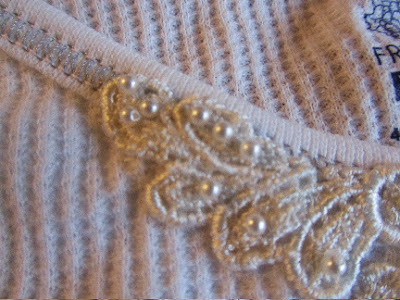 I'll be adding a bit of lace to the cuffs of the long undie pants, too. 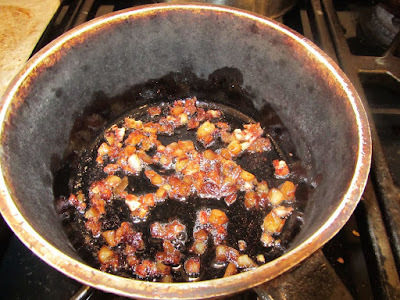 (Photo when that's done.) These will definitely suit my "pearls and lace" daughter. My only cost was for the long underwear itself (WalMart, about $8 for top and bottom combined). I'm working on bracelets for each daughter this week, as well, using plastic rings that scarves came on from the store last year (I really do save a lot of stuff), strips of fabric, and some beads and charms. When I finish these both up, I'll show you how they turned out. The same idea would work for a small girl, using shower curtain rings as the bracelet base, or for an older girl, using plain plastic bangles. Here's how the denim one is looking, so far. How are your Christmas gifts coming along? I've found that by just doing a little bit every day, I am making progress. I have made a lot of Christmas earrings by using small ornaments. They abound everywhere and be gotten quite cheaply. I try to get ones that have the design on both sides, but it's not always necessary. 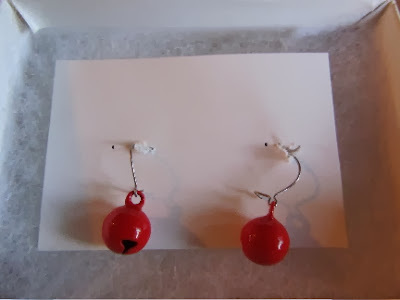 those mini ornaments for tiny trees would make cute earrings! I haven't even started on my Christmas presents yet! I'm hoping to figure out what everyone is getting this week and then start on them at the beginning of December. I was thinking of you this week because I went to a clothes swap and a friend altered the waist of her old jeans so they would fit me. It reminded me of when you altered jeans for your daughters. I can't wait to hear what you're making this year! Will you be going back home by plane? Can you bring liquids (like home canned foods) with you en flight, there? Wow! You've been busy! 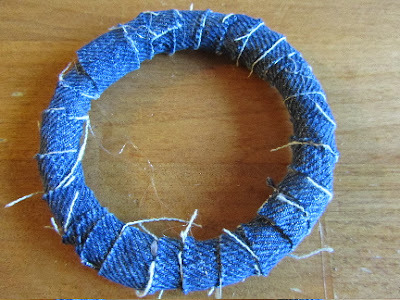 I've been seeing cute bracelets made over old bangle bracelets by wrapping yarn around them. Ravelry (knitting website--free and fun) has some cute knitted bracelet and necklace patterns that I'd like to try one of these days. I did finish up my knitted doll clothes and I have them wrapped and ready to go for "Christmas" on my husband's side of the family (on the day after Thanksgiving). I also made family photo books for my in-laws, so I guess we're both on the create-Christmas-gifts schedule. It's a blessing that we celebrate Christmas early with my husband's family--I have to get a move on early! I had one other idea for a bracelet, but not one that would suit my daughters' tastes. I thought wrapping raffia or twine around the bangle, then maybe a spray of clear lacquer over the raffia to hold it in place. I may try a few of those in the spring, for myself. You are doing great! You know, that is really nice that you are forced by schedules to have some of your Christmas all done by Thanksgiving. I set an early deadline for myself with gifts that I have to send away, so that I don't have to stand in long lines at the PO. And then the bonus is that I can just spend more time focusing on the celebration. I love your idea to embellish thermals! That would be a good gift at my house! I've been making gifts and posting about it on my blog. 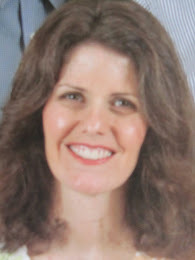 I've been following your gifts series. I love the pillow you made for Elsa -- so beautiful and delicate! I've been doing a couple of bookmarks, as well, only using ribbons and ribbon clasps for the part that is held in the book itself. I'll post a photo soon. What great ideas for re-purposing! I need to go through my sewing/crafting items and see what I've got for Christmas. My little gal would love some bracelets, so I'm looking forward to that post! those Christmas odds and ends in craft and sewing supplies are so fun to play with. I just came across some red and white candy-striped fabric that I'll try to do something with, too. Oh, bracelets for your little girls would be soooo easy. You use shower curtain rings as a base. You can get a pack of 10 at the dollar store for $1, and make extras for nieces, or save for your own daughter's birthday party, and make bracelets as party favors. I'll get more posted on those soon. What a fabulous idea! I'm going to have to see if my Dollar Tree has them. I'm always amazed at what they carry there.